Business Insider had this post about Americans saving money at the gas pump. You can read the whole post here. Back in November, economists excitedly predicted that lower oil prices would be great news for consumers. They suggested that Americans would save about $42 per month if gas prices remained low throughout the year, which would then translate into more discretionary spending. But somewhat surprisingly, for the most part, Americans have opted to save that extra money, rather than to spend it. Still, Americans did spent some of their newfound riches. 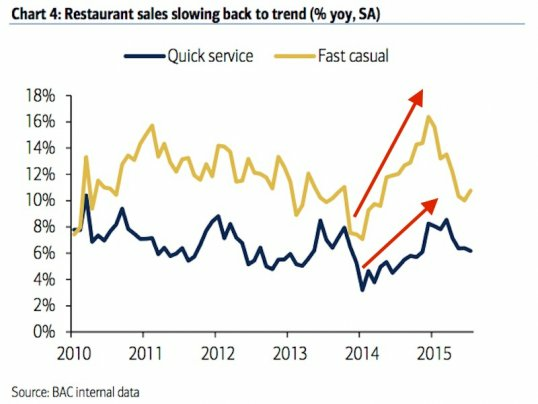 According to analysts at Bank of America, those savings went toward eating out at “quick service” restaurants like McDonald’s and Wendy’s and “fast casual” restaurants like Chipotle and Panera Bread.